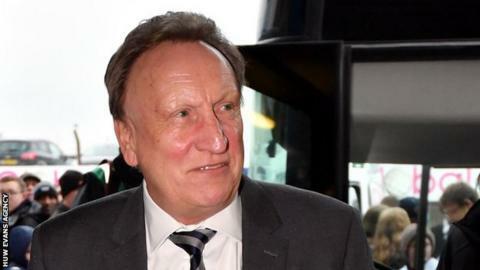 Neil Warnock has described his Cardiff City's 2-0 Championship win at former club Leeds as one of the best of his 37-year managerial career. Sean Morrison and Kenneth Zohore struck after the interval. "It's the best performance by a mile since I've been at the club," said Warnock after Cardiff rose to 14th. "It's the best away performance in the circumstances probably not far off of me being a manager because it was almost complete." Warnock was as pleased with goalkeeper Allan McGregor keeping a clean sheet as the goals that earned victory. Centre-halves Morrison and Sol Bamba also impressed the Bluebirds boss. "Even the save at the end kept a clean sheet, which I wanted," said Warnock, whose management career began at Gainsborough in 1980. "But the two centre halves I thought were outstanding, Morrison and Bamba. "I said to those two, especially Sol, you don't have to prove anything, just be a centre half today. "Don't start dribbling and doing stupid things, well the Leeds fans expect him to and I thought he played a typical centre-half role. "The full-backs were good. Greg [Halford] did his job I think on [Pablo] Hernandez."